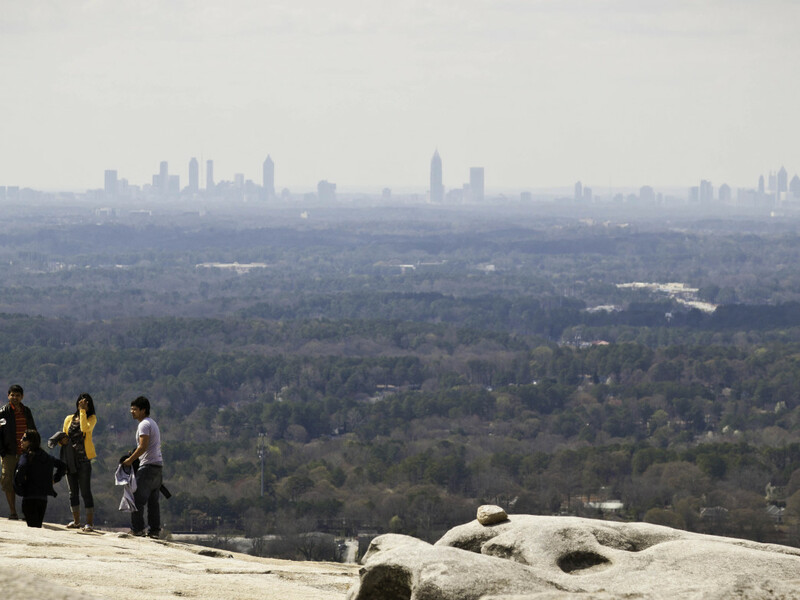 Stone Mountain Park is where locals spend countless hours running, hiking, cycling, walking the dog or simply people watching. The 15 miles of trails at Stone Mountain Park are well traveled, making them suitable for smooth trail runs. If you hit these trails in the early morning, you'll have them all to yourself. 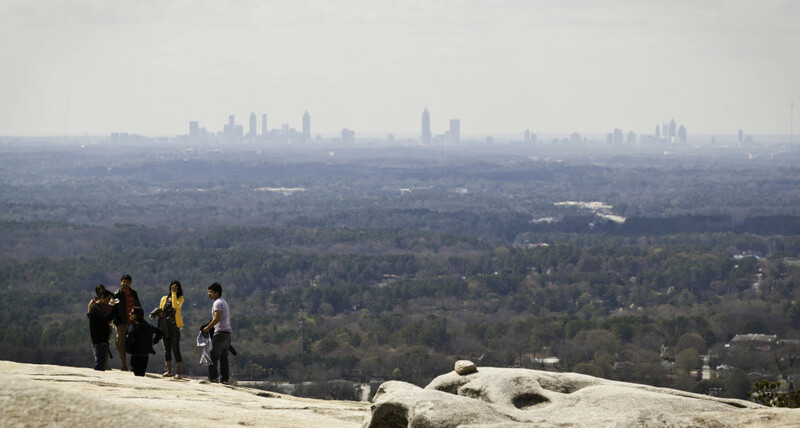 Stone Mountain is an iconic presence in metro-Atlanta, where the granite dome can be seen looming in the west from downtown Atlanta or north of the city. A rite of passage for visitors to the park is the short hike to the summit, but consider Stone Mountain a hub where trail and road running, and cycling, revolve around its base. A bucket list check-off for anyone in Atlanta is hiking the 1.3 mile (one way) summit trail. The distance is short, but the elevation gain catches up with you quickly, especially on the second half of the hike. The quartz stone is fairly smooth and rocks stud the landscape, giving you a few high steps to climb. This trail is predominantly sunny and can get scorching hot in the summer. A few pines spatter the first half of the trail, but as you journey on, they disperse and the top of the mountain is full sun. A pavilion is located about half a mile up the mountain, and it offers a good spot to rest, if needed. After the pavilion, the steepest part of the trail is a definite calf burner. From 1,400 to 1,600 feet, you hike 0.2 miles, not even one lap around the track. Don't worry, one short section contains a railing that hikers use to propel themselves. The summit rounds out at 1,648 feet for incredible views of Atlanta’s suburban sprawl. To the west, you can see the three chunks of skylines: the shorter cluster of buildings to the north is Buckhead, a pair of taller buildings in the middle is Midtown, and to the South a bar graph of varying heights represents the downtown skyline. On a clear day, you can see Kennesaw Mountain looming a good 40 miles to the northwest. An example of Georgia’s varying terrain is the stretch of the Blue Ridge Mountains to the north and the lowlands to the south. No matter where you live in the city, the bird’s eye perspective reminds you that Atlanta is not a cement jungle. Besides the walk-up trail, Stone Mountain Park has 15 miles of both off-road and paved trails. These are mostly rolling terrain with short ascents and descents that test the quads.For trails, the white-blazed Cherokee Trail is 5 miles and the Nature Garden trail is a 0.75 mile detour through a hickory oak forest. The an off-road loop is less traveled than Stone Mountain’s summit trail or the popular paved trail that follows along Robert E. Lee Boulevard. The white markings on the Cherokee Trail guide you through over woodlands and bridges. Several creeks give canine trail running buddies a nice reprieve from the heat. 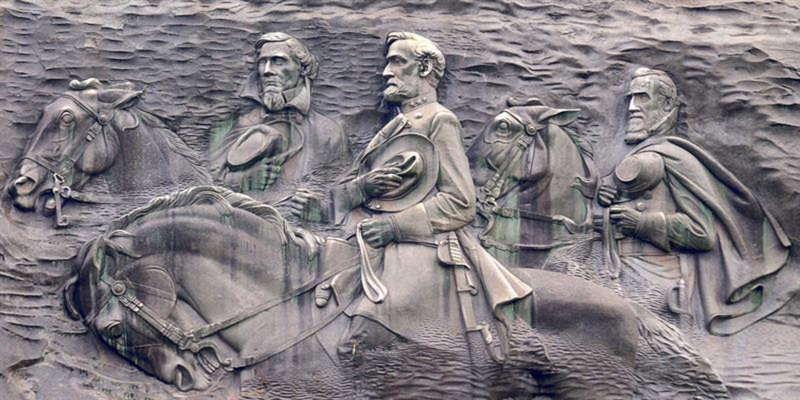 Exploring the park on foot gives you historic views of the memorial Confederate carving and “Laser Lawn”, and leads you by Howell Lake, Stone Mountain Lake and Venable Lake. At one point, you’ll trek over the granite slopes and cross over the summit’s walk-up trail. Parking is available in lots along Robert E. Lee Boulevard, and there are plenty of access points. It’s easy to tack on extra trails: the Nature Garden is a quick detour with a range of Dogwood, Magnolia and Sweet Gum trees.For pavement, follow the path along Robert E. Lee Boulevard for a 5 mile loop. Start your run at the intersection of E. Mountain Street and run counterclockwise. You start out with a cruising downhill for the first mile, descending 200 feet, before rounding out to a ribbon of minor dips and varying flatness. From the West gate entrance to Grist Mill, a majority of the road is one way and counterclockwise, and one lane becomes designated for bikes and pedestrians. The hardest part of the route is toward the end of mile 3, where you'll climb back up almost 250 feet over 0.4 miles. Another way to access the park is via the Stone Mountain trail. It is popular among urban cyclists and ends at the west end of the park, shortly after crossing Main Street. This 19 mile marked path begins in Midtown at Piedmont Avenue and is entirely paved, although there is about 4 miles of on-street travel. Hikers looking for a great view of the city and little workout. Parking is available at several lots in the park and park entry is $10 per vehicle. The locals park in Stone Mountain Village for free and run in to the park using the Stone Mountain bike path. Dogs are allowed in the park, however none can be taken on the walk-up trail. The walk-up trail is open from dawn to dusk. At the top of the mountain you’ll find restrooms, a souvenir shop and concession stand. If you’re burned out from the hike, you can take the Summit Skyride down the mountain for a fee. Note that pets are not allowed on the walk-up trail, but can be taken on the other park trails. After rain, the stone can become slick, so use caution on steep parts of the trail.